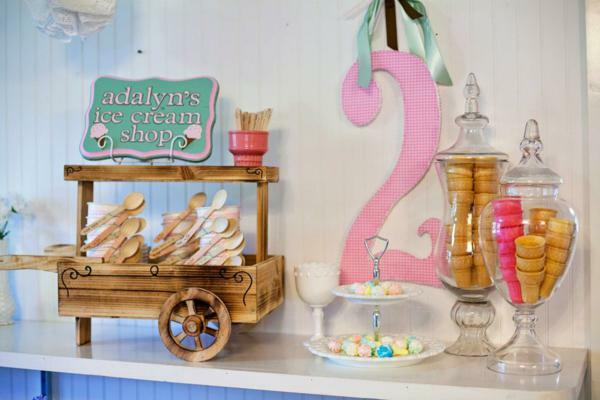 This adorable VINTAGE ICE CREAM SHOP 2ND BIRTHDAY PARTY was submitted by Julia Shultz of Let’s Have a Ball! Parties and Events. 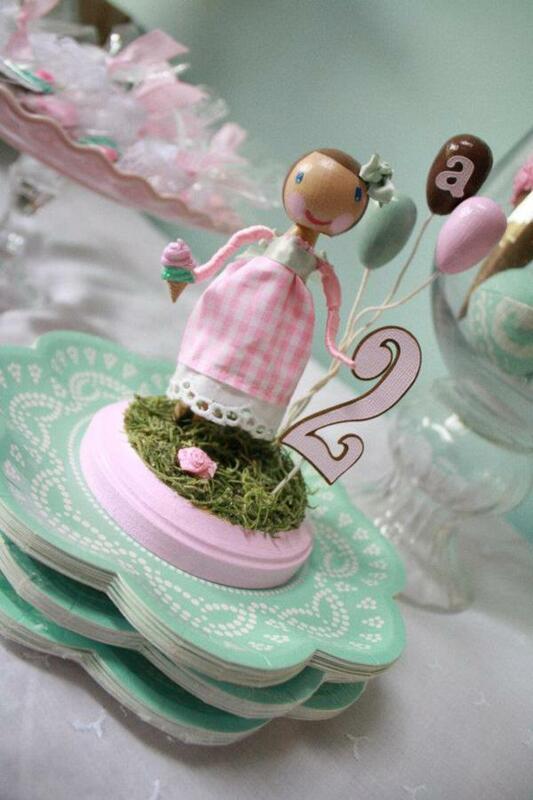 Julia said- “Thank you for letting me share my baby girls 2nd birthday party. 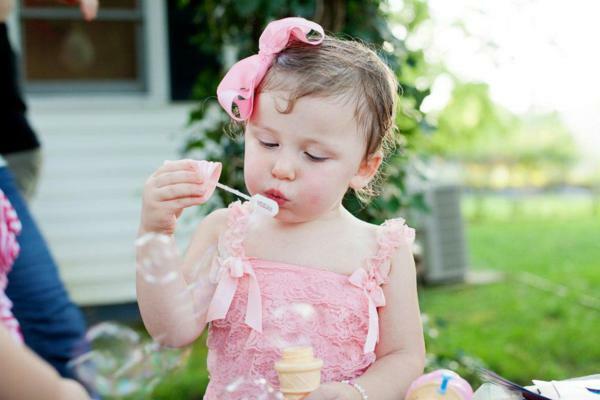 My daughter, Adalyn Kate, celebrates her birthday during the hottest part of the summer. 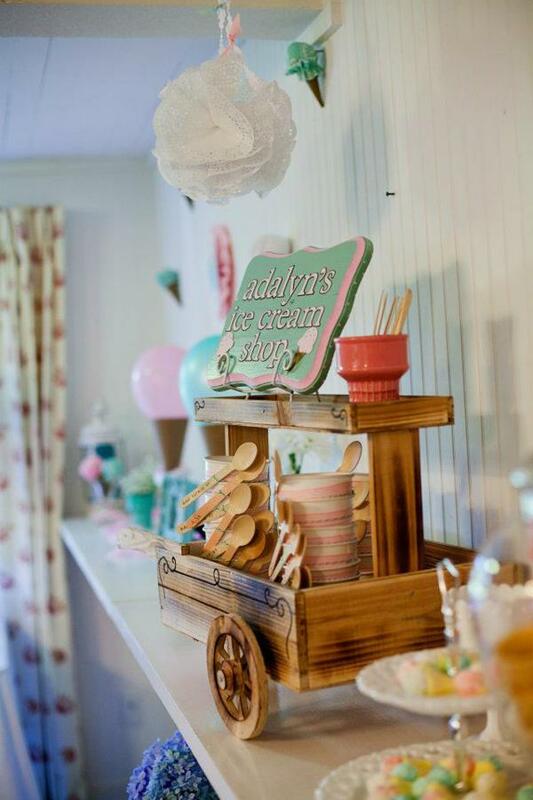 When its hot outside, theres not much better than stopping by the ice cream shop to cool off so it was easy to choose the theme for her party: Vintage Ice Cream Shop! 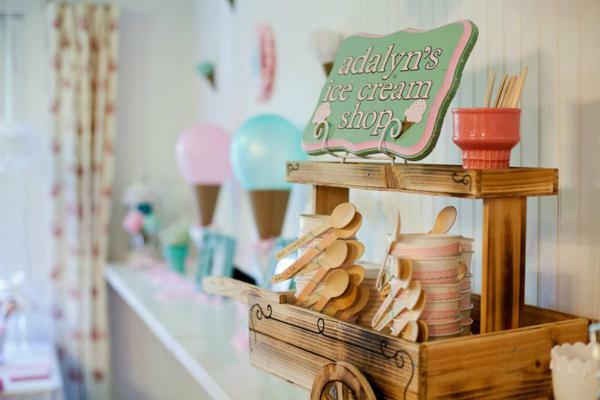 I was able to book her party in a beautiful, historic farmhouse which was also once an adorable café. (Hidden Mountain Rentals in the Great Smoky Mountains area) This made the perfect backdrop for her theme! 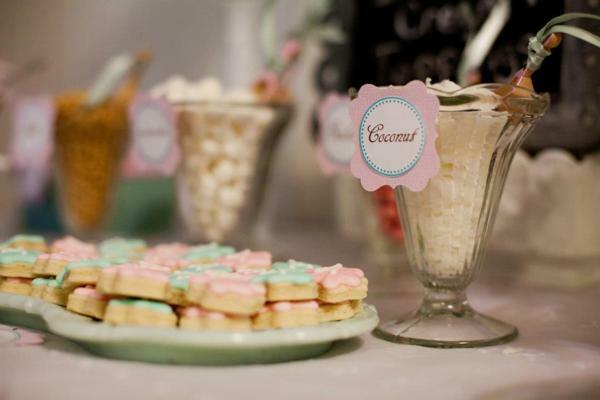 I simply adore beautiful vintage milk glass and antique furniture so I already had quite the collection to set the tone for the party. I used several pieces of my milk glass throughout. I filled milk glass vases with fresh flowers which included white daisies, babys breath, and hydrangeas. 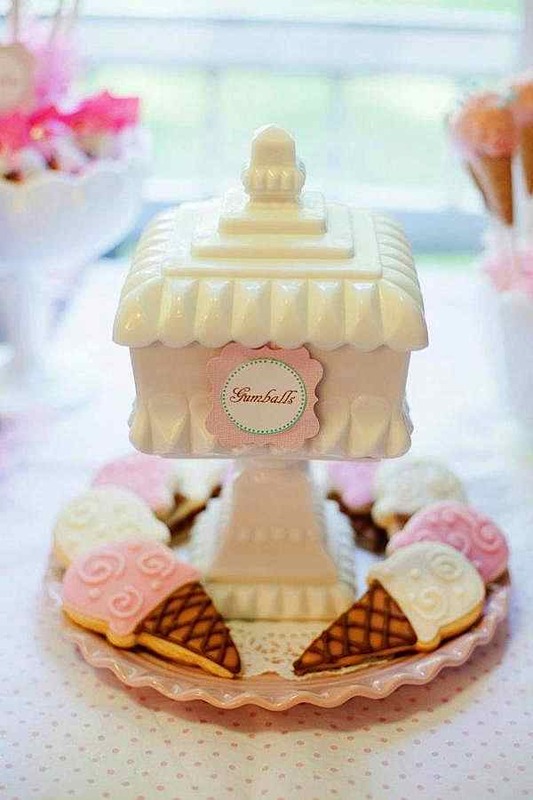 I used several of my vintage compotes and dishes on the sweets table to hold treats which included pink and white gumballs, sweet tarts, ice cream cone shaped marshmallows, ice cream shaped chocolates, as well as to hold the cake pops which were made onto mini ice cream cones. 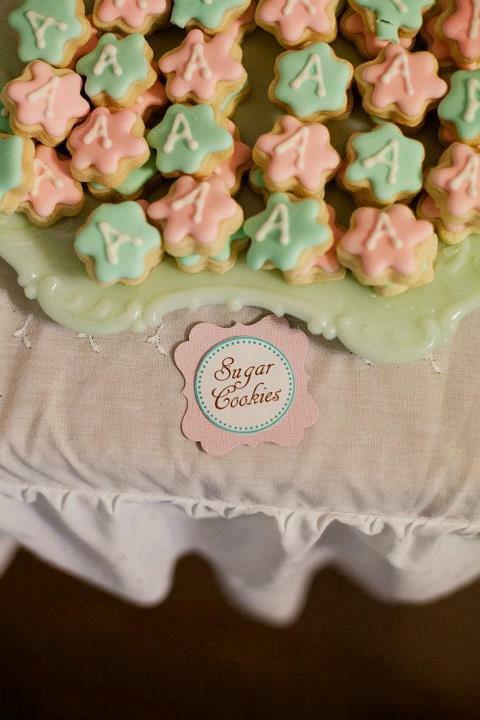 To complete the sweets table, there were iced sugar cookies. 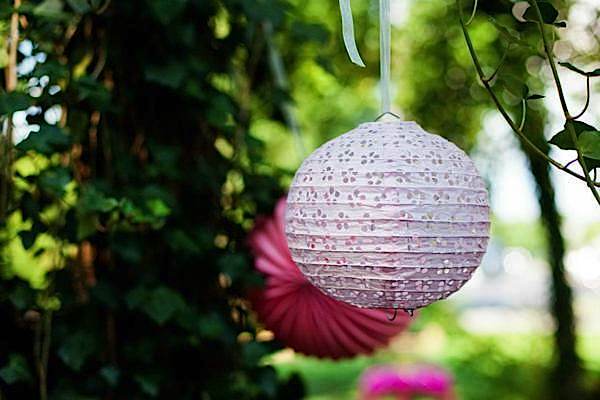 Some were decorated like ice cream cones, and the others were decorated in a pink gingham print which was a staple of the party. 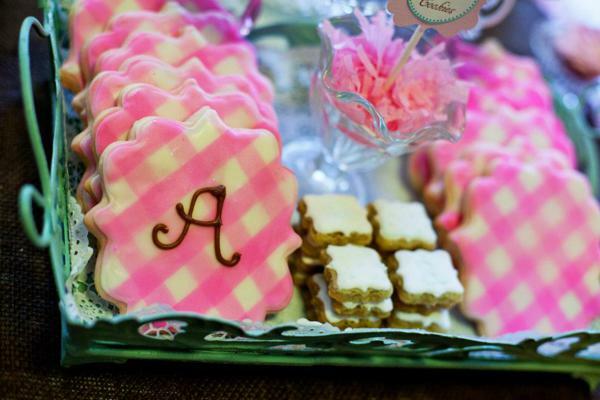 I used the pink gingham everywhere- from the cake topper, to Adalyn Kates party dress, to the water bottle labels, and more. 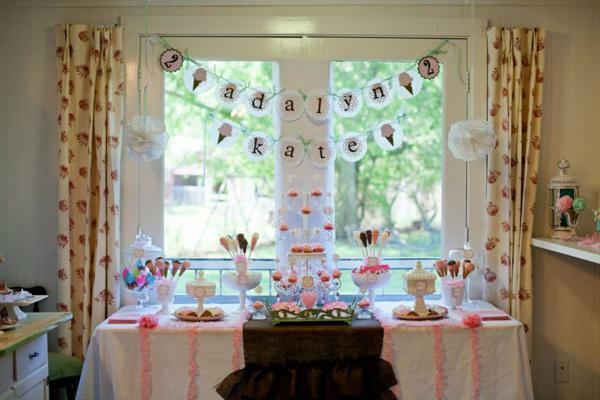 I created all the candy labels as well as the personalized birthday banner hung above the table…. 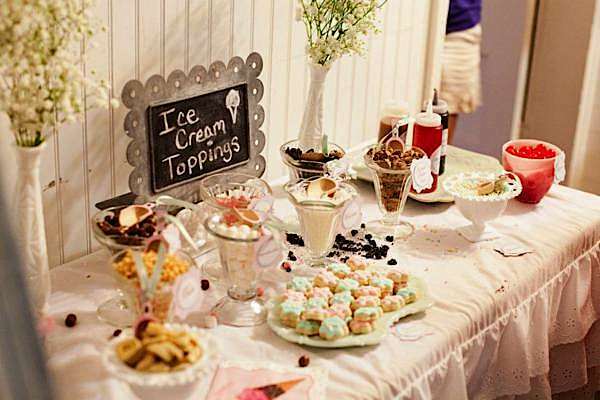 …..I also included an ice cream toppings bar. I used vintage sundae glasses to hold the toppings. Toppings and mix ins were strawberries, bananas, chocolate chips, nuts, cookie dough bites, marshmallows, pink sixlets, coconut, oreos, peanut butter cups, pearl sprinkles, mini sugar cookies, cherries, chocolate sauce, strawberry sauce, and caramel. I had vintage coke glasses for coke and root beer floats. 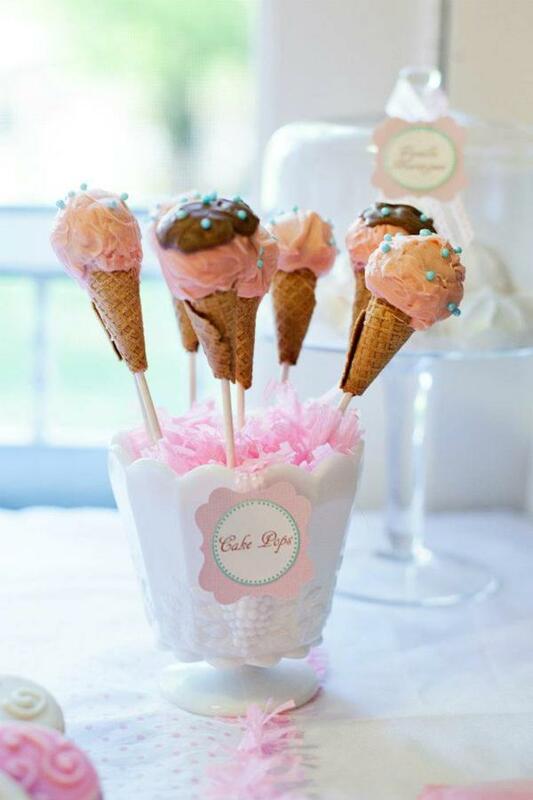 I used adorable little wooden scoops which I added a bit of pink paint and then personalized. 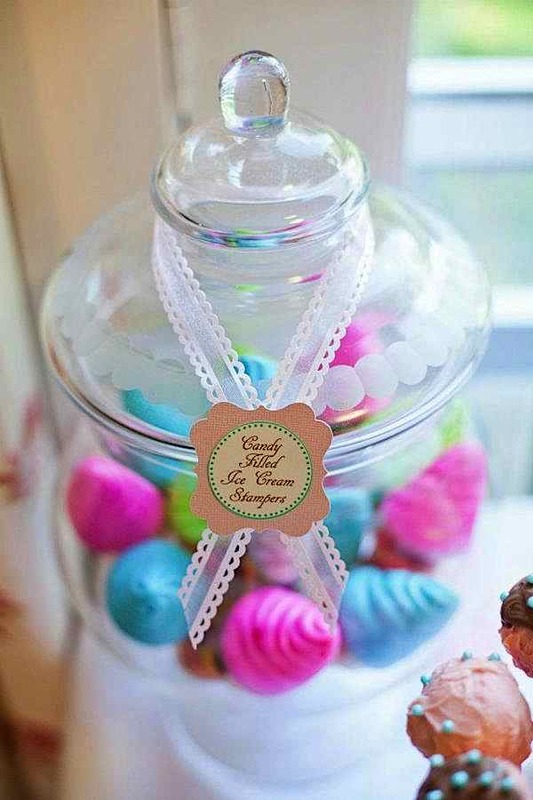 I displayed the ice cream in tin pales and labeled each flavor, accenting with a doily. 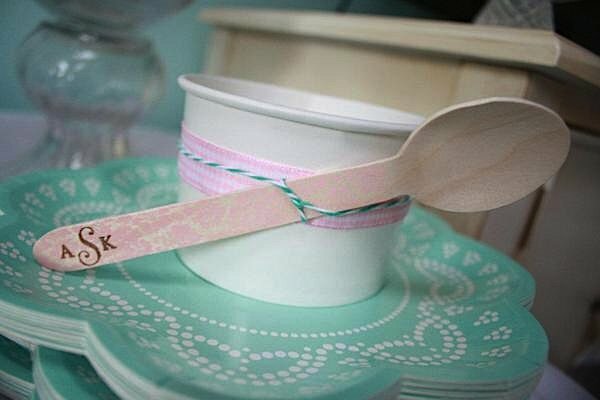 Ice cream cones were displayed in apothecary jars, and I also provided white paper bowls which I tied an adorable wooden spoon to with mint bakers twine. 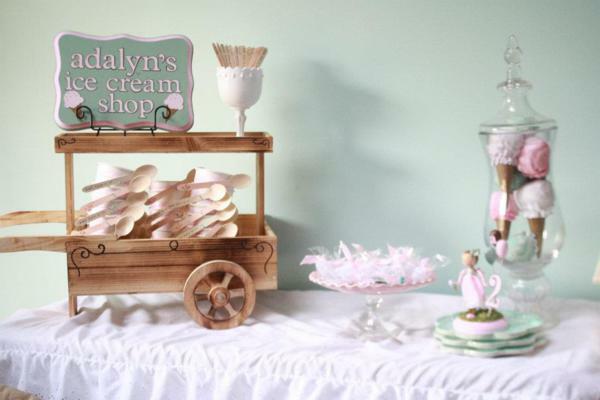 The wooden spoons, scoops, and little baskets were purchased from tulleANDtwig on etsy. 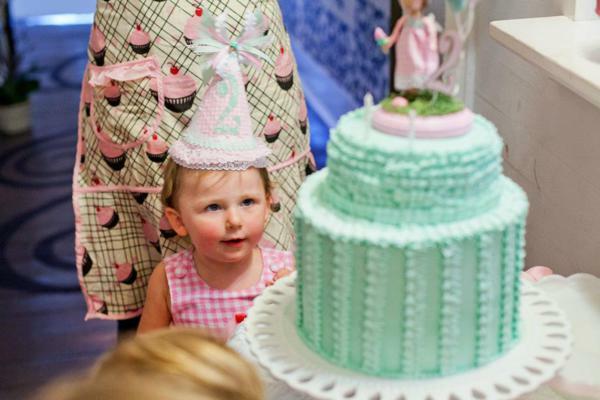 She beautifully painted a pale seafoam damask print on half and pale pink on the others and then added my choice of wording on them: Addi Kate is 2! 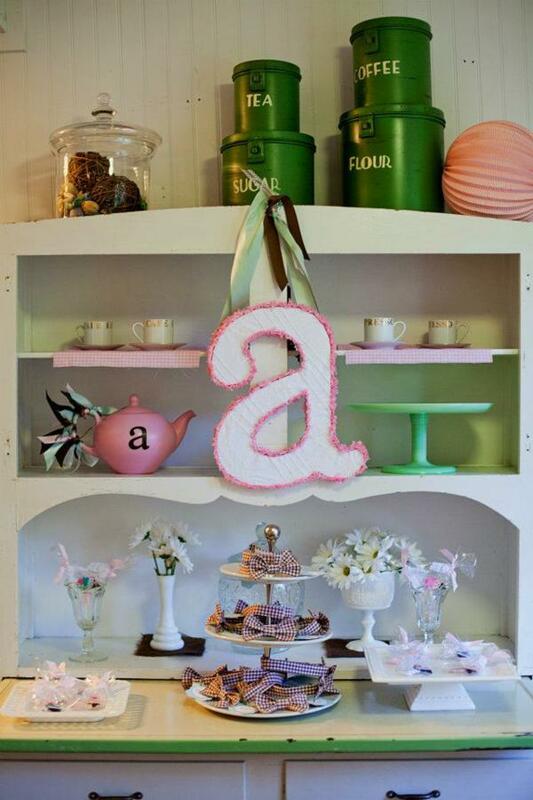  as well as her monogram. 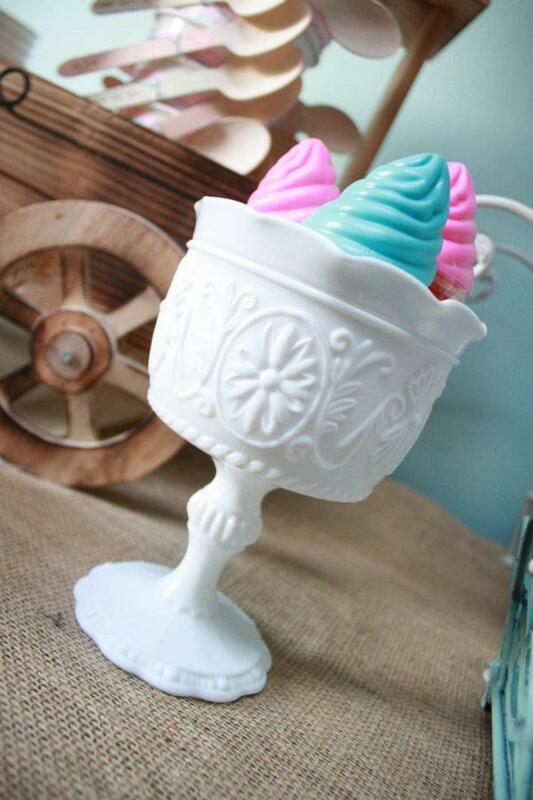 To add to the feel of the vintage ice cream shop, I found an adorable antique miniature ice cream parlour table and chairs set which I used as the centerpiece of the drink table. For drinks I had glass bottle cokes and root beer, pink lemonade in jelly jars with adorable daisy lids (ShopSweetLulu.com) and paper straws, as well as bottled water with custom, personalized labels (SimplySprinkled on etsy). 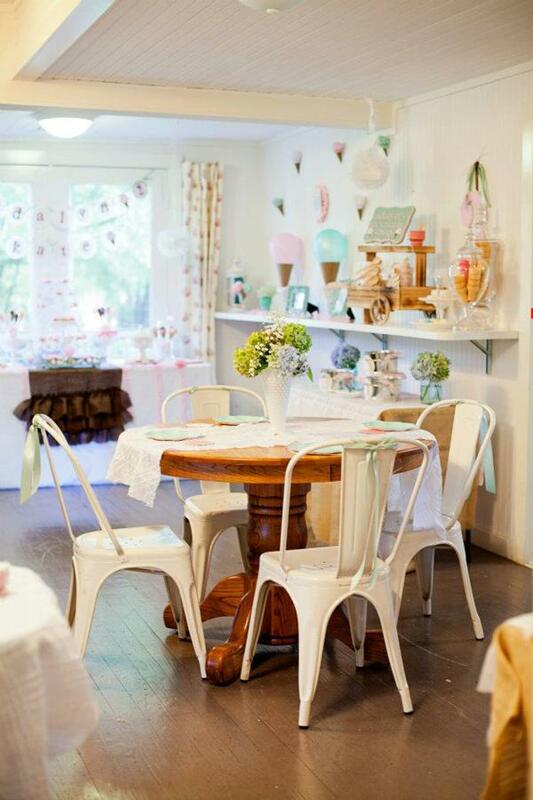 I used eyelet paper lanterns to hang throughout, made mint colored tissue paper poms, created doily poms, and also had balloons on the ceiling of the café. 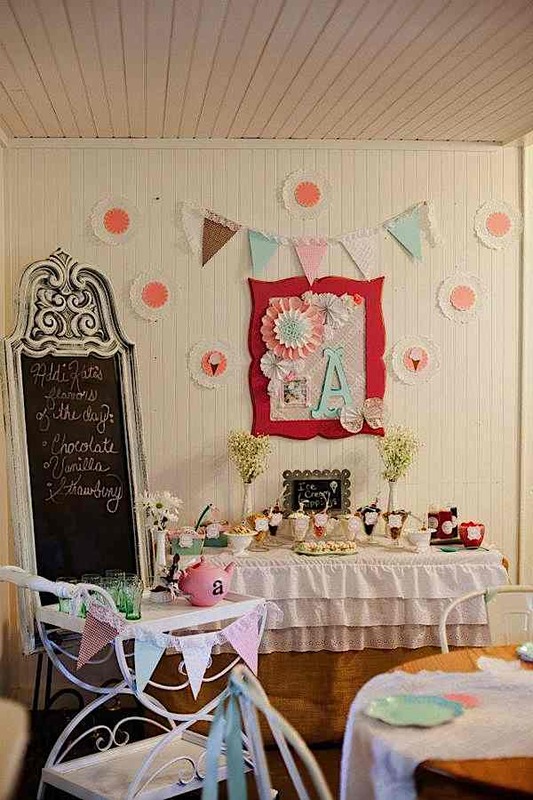 I hung fabric buntings I created with fabrics used throughout the party in various places. 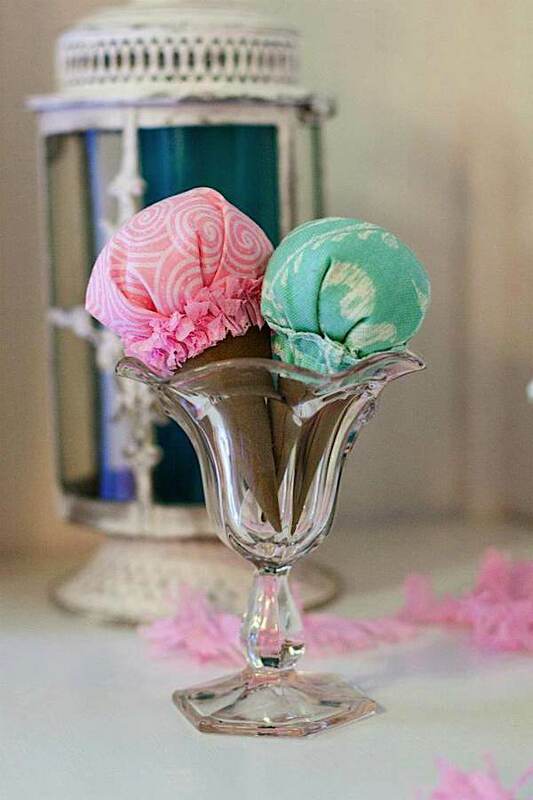 I created fabric stuffed ice cream cone decorations and used them on walls and in jars. Fresh flowers in vintage vases adorned tables, cabinets, and niches. I use various sizes of doilies as wall decorations as well as for placemats. 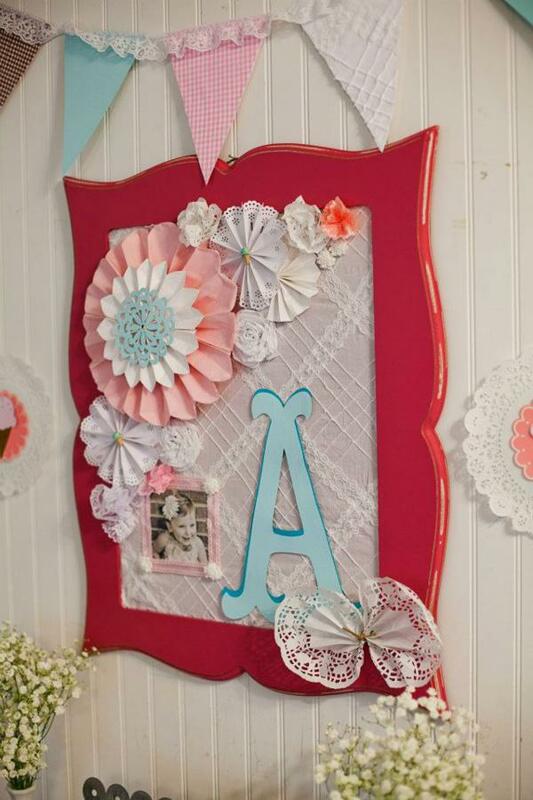 I created a bit of framed art using paper flowers, cutouts, fabric, and a photo above the toppings table. Tons of textured fabrics were used such as pretty white lace, eyelets, and some pretty quilted fabrics, as well as beige and brown burlap. 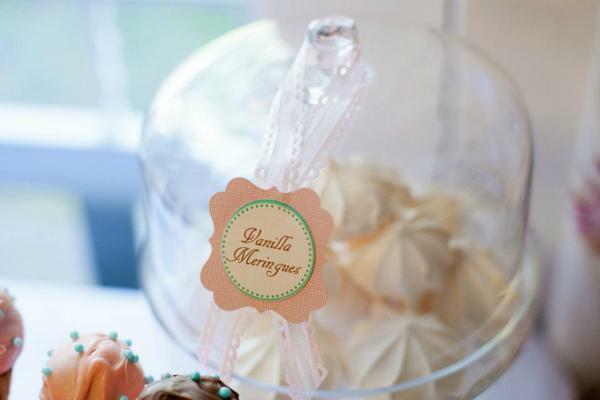 Ruffles were added to tablecloths for an extra delicate, feminine vintage touch. 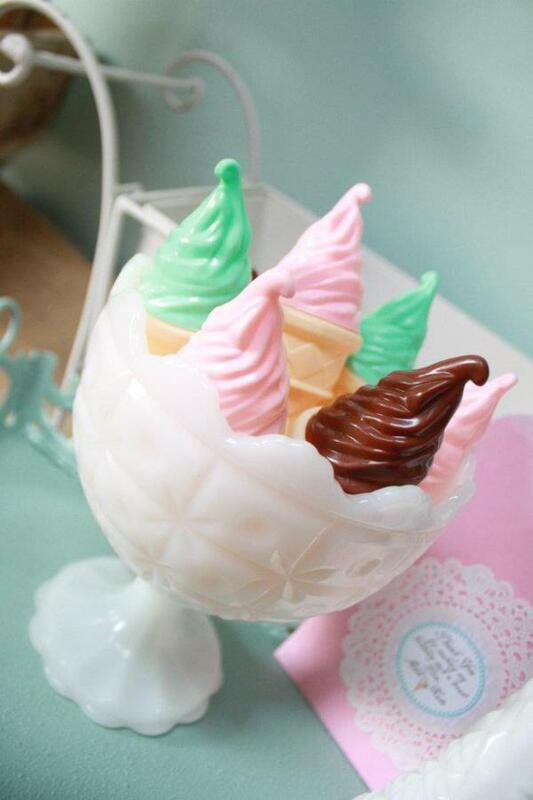 Large balloon ice cream cones were created for décor as well. I also used a gorgeous repurposed framed chalkboard for the flavors of the day and placed a pretty white tea cart in front which held the vintage coke glasses. 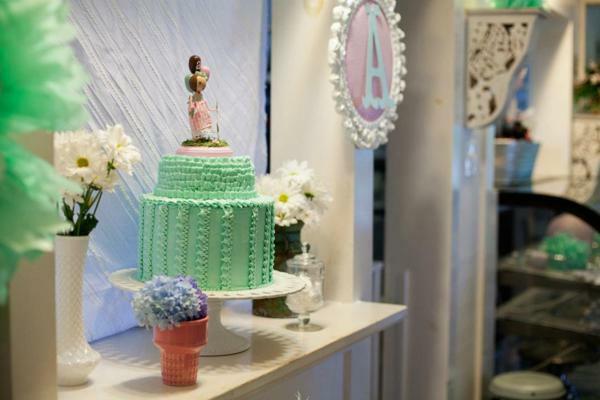 The mint colored ruffled birthday cake (Melissa Archer) turned out absolutely perfect! I created the little wooden doll topper out of a clothespin. I painted it to look like the birthday girl and made the dress to coordinate with her party dress! I made the little party hat as well. 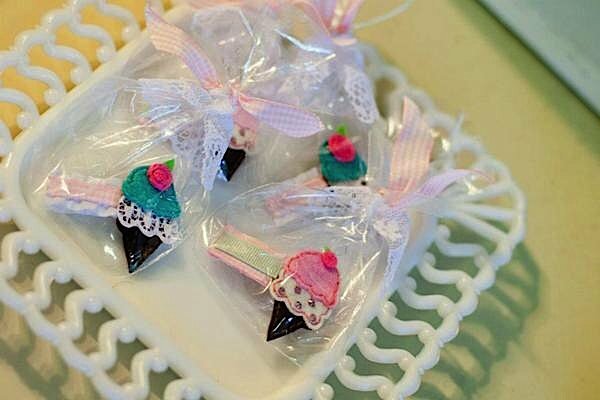 The activities for the children included sand art using ice cream cone necklace containers. We also had a super fun water slide and other water activities. I just found your website and I absolutely love it! 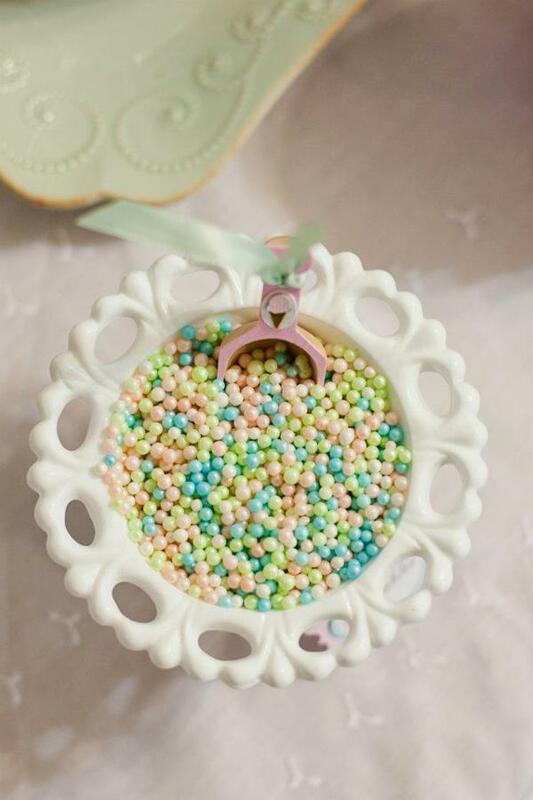 I have never seen anything so cute and exciting…it makes me want to have a party. 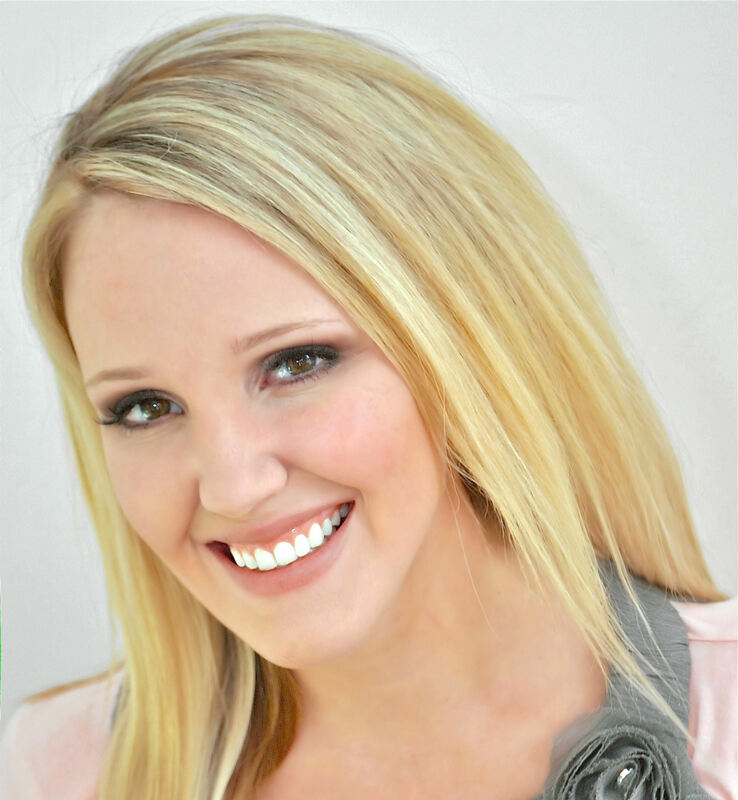 You were recommended on my daughter’s site Lifeonplanetmommy…thank you for inspiring us all! So, so cute!! I love all the details. All the vintage items really pull it all together – I’m never that lucky to score such awesome finds. 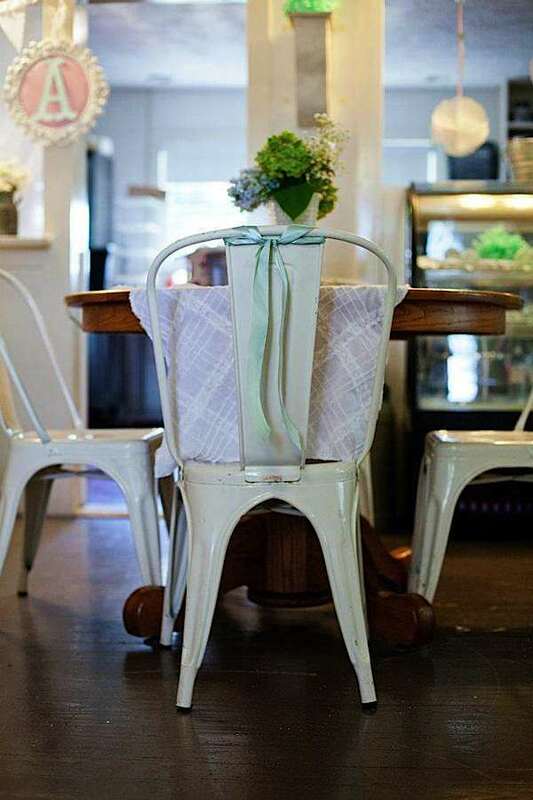 Where did you find the mint green doily/eyelet looking plates? 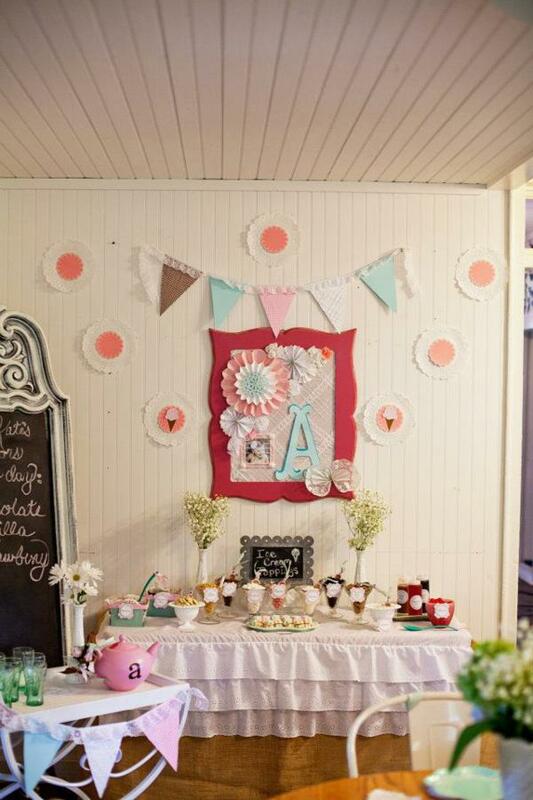 Thank you so very much for featuring my daughter’s party! 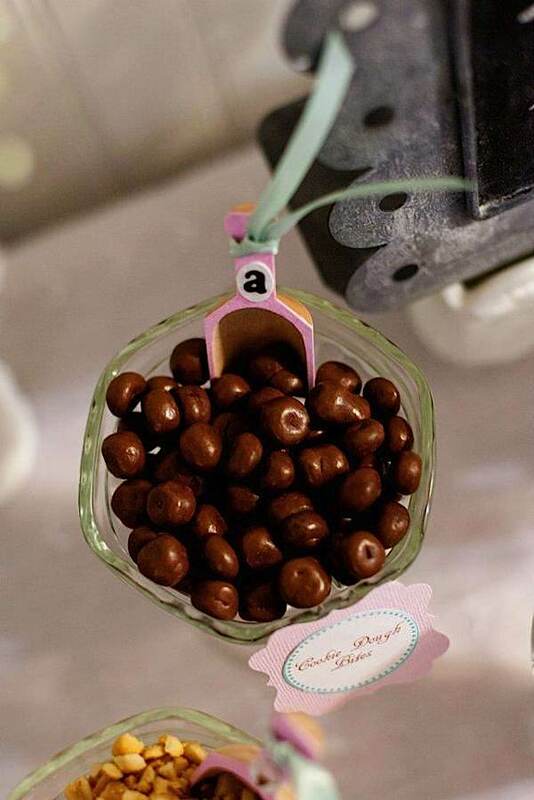 Lynn H. – thank you for the sweet comments! 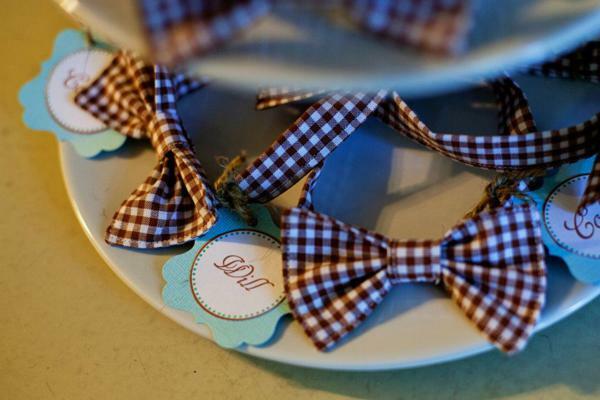 The plates I used were purchased from shopsweetlulu.com.